Innomuzzle are best protective device for safe examination and enhanced protection. These are provided with inner soft lining to provide extra comfort to your beloved pet. Adjustable Innomuzzle has extra advantage of sure shot fitting to your pet. 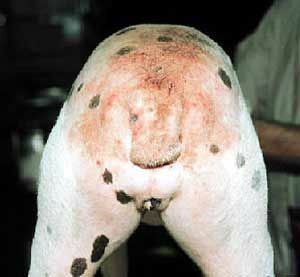 The adjustable snout circumference can greatly be reduced or extended. Muzzle is a protective aid used to fasten around snout of pet dog, so that veterinary doctor can examine and administer drugs safely. Wearing muzzle become essential in untrained or aggressive pet dogs, however muzzle should always be applied as a safety measure. Muzzle are more frequently applied when veterinary doctor has to examine areas near to mouth of pet dog. muzzle provide necessary safety of bieng not bitten by pet dog when examining them. As we have our personal toothbrush, towel etc., same thing applies to utility aids for our beloved pet dogs. The worst practice is usage of single muzzle on number of pet dogs while examining them. It increases chances of aquiring contagious disease to your beloved pet dog. thus it become the duty of every owner to have personalized muzzle for thier pet dog. It not only safegaurd your beloved pet but also save pet dogs of other owners. Two type of quality muzzle are bieng manufactured by Innovation India. these are fix and adjustable type exclusively prepared from high quality durable cotton fabric and cushioned inside to provide extra comfort to your beloved pet dog. Regardless of which type of muzzle is used, the dog should be acclimated to it before use. This can easily be accomplished by pairing food with the muzzle. For the nylon muzzle, stick a small treat through the bottom and let the dog place his nose into the muzzle to take the treat. Repeat a few times, and as the dog becomes more comfortable, gradually begin to place the muzzle on the dog, using incremental steps. For example, dog takes treat, hold for five seconds, release; as dog becomes comfortable, dog takes treat, move muzzle back over dog's muzzle, release; next step, bring straps up behind ears, release; eventually, as dog becomes comfortable, attach straps, feed through muzzle, release. 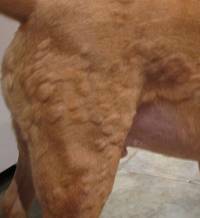 Veterinarians who limit their practice to dogs and cats see a lot of skin problems. There are numerous conditions that cause problems with a dog or cat's skin, but the most common, by far, is allergies. A dog who is allergic to something will show it through skin problems and itching, i.e., pruritus. It may seem logical that if a dog is allergic to something he inhales (atopy) like certain pollen grains, he will have a runny nose; if he is allergic to something he eats (food allergy) such as beef, he may vomit; or if allergic to an insect bite (urticaria or hives), he may develop a swelling at the site of the bite. In reality, the dog will seldom have these signs. Instead, he will have a mild to severe itching sensation over his body and maybe a chronic ear infection. In addition, allergic dogs will often chew on their feet until they are irritated and red. They may rub their faces on the carpet or couch, or scratch their sides and belly. Because the wax-producing glands of the ear overproduce as a response to the allergy, they get ear infections. Bacteria and yeast often "over grow" in the excessive wax and debris. The skin lesions seen in an allergic dog are usually the result of him mutilating his skin through chewing and scratching. Sometimes there is hair loss, which can be patchy or inconsistent over the body leaving a mottled appearance. The skin itself may be dry and crusty, reddened, or oily depending on the dog. It is very common to get secondary bacterial infections of the skin due to these self-inflicted lesions. Remember that dogs must be exposed to the allergen for some time before the allergy develops. Exceptions may occur such as an allergy to insect bites, which may develop after only a few exposures. The dog's body must learn to react to the allergen. It is a learned phenomenon of the immune system that is genetically programmed and passed from generation to generation in several breeds. Allergies are especially common in certain terriers such as the Scottish, West Highland White, Cairn, and Wire Haired Fox; Lhasa Apsos; and larger breeds such as the English and Irish Setters, Retrievers, and the Dalmatian. Allergies are also well documented in the Pug, Miniature Schnauzer, and English Bulldog. In pets, allergies usually start to develop between one and three years of age. They may start as late as age six or eight, but over 80% start earlier. To make matters worse, as the animal ages, he usually develops allergies to additional things and the response to any one allergen becomes more severe. Most allergies are the inhalant type and are seasonal (at least at first). The dog may be allergic to a certain tree pollen that is only present in the environment for three weeks out of the year, or the allergy may be to house dust mites which are in the environment year round. For example, a dog may start chewing his feet, scratching his sides, and rubbing his face on furniture every year for three weeks during the same month. These are often the signs of a seasonal allergy to something such as ragweed or tree pollen. In this case, the veterinarian may choose either tablets and/or a single injection that will suppress the allergy for the 3-4 weeks necessary when that allergen is in the environment. After a short treatment period, the animal is back to normal and only has to wait until the following year when he or she will be returned to the veterinarian with the same problem. Topical therapy consists of shampoos and rinses and topical anti-itch solutions. Topical therapy offers immediate, but short-term relief. It is often recommended to bathe recommend atopic dogs at least once every two weeks with a hypoallergenic shampoo or colloidal oatmeal shampoo. Hydrocortisone shampoos may also be used. Weekly or even twice weekly shampoos may offer increased relief for some dogs. In addition to bathing, it is helpful to simply wash off the dog's feet after he comes in from the outside. This will remove any allergens from his feet. Topical solutions containing hydrocortisone may offer some relief. They are the most practical in treating localized itching. These products are very poorly absorbed into the bloodstream, and when used in moderation, do not create long-term side effects or problems associated with injectable or oral steroids. In addition, cooling salves and lotions may also be used. Care must be taken with these to ensure that they do not make the coat too greasy. Dogs may tend to lick off these preparations. After applying these preparations, it is recommended to get the dog involved in some activity to prevent him from licking the treated area. An animal must undergo intradermal skin testing prior to hyposensitization. 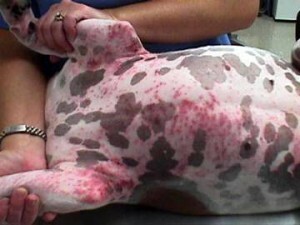 After the antigens to which the animal is allergic have been identified through testing, a commercially prepared injection containing the altered antigens is injected into the dog. Depending on the type of product used, a series of weekly or monthly shots are given. The animal then becomes de-sensitized to the offending allergens. Success is as high as 80% with this treatment plan. Treatment is time consuming and requires a dedicated owner and veterinarian. This treatment is an excellent option in severe cases of atopy, especially in young dogs. If you have an allergic pet that is not responding to conventional treatment, seriously consider this as a treatment option. Fatty acids have been recommended for years to improve coat quality and shine. Recently, new research has shown that certain fatty acids - the omega-3 fatty acids - are also very beneficial in the management of allergies in dogs and cats. Omega-3 fatty acids work in the skin to help reduce the amount and effects of histamine and other chemicals that are released in response to allergies. Not every allergic pet responds to omega-3 fatty acids. Some pets show improvements, others have a complete cure, and others show no change after being on the omega-3 fatty acids. Most pets need to be on the omega-3 fatty acids daily for several weeks to months to notice significant improvement. Omega-3 fatty acids are very safe and have very few side effects. Studies show that when omega-3 fatty acids are used in conjunction with other treatments, such as antihistamines, the use of steroids can often be decreased or discontinued. Be sure to use an omega-3 fatty acid supplement derived from fish oil. Other types of fatty acids (such as omega-6 fatty acids) can actually make some allergies worse. It is often best to use the omega-3 fatty acid supplements in conjunction with a diet lower in fat. Every animal will respond differently to each of the different antihistamines. Therefore, several different antihistamines may have to be used before an effective one is found. Every antihistamine has a different dose and risk of side effects. Antihistamines should be used with veterinary guidance. Some common side effects include sedation, hyperactivity, constipation, dry mouth, and decreased appetite. The correct antihistamine given at the proper dose should not cause unwanted side effects. For severely itchy dogs, mild sedation may be a positive and desired side effect. Cyclosporine, in the form of the brand name drug Atopica, is being used very successfully in the treatment of atopy in dogs, especially those with severe allergies. The most common side effects are diarrhea and vomiting. It does not work immediately, but may take 3-4 weeks to see an effect. It t may be used for short periods of time for seasonal allergies, or can be given long-term for year-round atopy. Steroids are extremely effective for relieving severe itching and inflammation. The problem is that they can have many short and long-term side effects, if not used correctly. If used correctly, they can be as safe as any other drug that we use. The problem is that they work so well that they are often overused. Because of their potential side effects, they should be used carefully, and at the lowest effective dose. They are usually reserved as one of the last lines of treatments, but if nothing else works, use the steroids. Oral: As mentioned earlier, it is much easier to customize an individual dosing program with the tablet form. The affected animal usually begins with daily therapy for a period of three to five days, and then the dose is reduced to every other day dosing. If the animal needs to be treated for more than a couple of weeks, then the dose is halved weekly until a minimum therapeutic level can be established. The goal with all steroids is to use the minimum dose necessary to alleviate the symptoms. By taking this approach, the side effects are eliminated or reduced. Since bacterial and yeast skin infections are common in dogs with allergies, it is important to treat the infections as well as the atopy. A yeast infection would be treated with an antifungal medication. A skin culture and sensitivity may be performed to best identify which antibiotic to use in the case of bacterial infections. In addition, special shampoos may be helpful to control these infections. Griffin CE. Cyclosporine use in dermatology. In: Bonagura JD, Twedt, DC. Kirk's Current Veterinary Therapy XIV. WB Saunders, Philadelphia PA. 2009:386-389. Rosser EJ. Advances in the diagnosis and treatment of atopy. In: Campbell KL. Veterinary Clinics of North America Small Animal Practice: Dermatology. WB Saunders, Philadelphia, PA. 1999;29(6):1437-1447. Scott DW, Miller WH, Griffin CE. Skin immune system and allergic skin diseases. In: Scott DW, Miller WH, Griffin CE (eds). Muller & Kirk's Small Animal Dermatology, 6th edition. WB Saunders Co, Philadelphia PA 2001:543-666. Song M. Multi-facet approach offers best results for allergy patients. DVM News Magazine 2003 (April):6-8. White PD. Atopy. In: Birchard SJ, Sherding RG (eds). Saunders Manual of Small Animal Practice 2nd Edition. WB Saunders Co, Philadelphia PA. 2000:339-346. Hives (urticaria) and a swollen face (angioedema) are typical hypersensitivity (or allergic) reactions to drugs, chemicals, something eaten, or even sunlight. What are the symptoms of hives and angioedema? In hives, small bumps occur within the skin. Often, the hair will stand up over these swellings. Sometimes, they itch. In angioedema, we see swelling of the face, especially the muzzle and around the eyes. Sometimes, the swelling is so severe, the dog cannot open his eyes. Angioedema often results in itching. Facial swelling and hives generally develop within 20 minutes of being exposed to the allergen (substance to which the animal is allergic). In general, these types of allergic reactions are not life-threatening and will go away by themselves. Rarely, the swelling in angioedema can affect the throat and make breathing difficult. A more severe allergic reaction, called anaphylaxis, is life-threatening, and requires immediate veterinary attention. How are hives and a swollen face treated? Antihistamines are generally the best treatment for angioedema and hives. If severe, steroids are sometimes given. If respiration is affected, epinephrine is administered. If your dog has hives or a swollen face, contact your veterinarian, who will advise you about the proper treatment. Can hives and angioedema be prevented? In general, there is no way to predict which animals may develop hives or angioedema as a result of exposure to a certain substance. If a dog has already had an allergic reaction, such as anaphylaxis, angioedema or hives, to a substance, the substance should be avoided. If your dog has ever had a reaction to a vaccine or medication, be sure your veterinarian knows and the information is placed in your dog's medical record. If your dog has ever had an allergic reaction to a vaccine, subsequent vaccinations should be given by your veterinarian. Your veterinarian will probably administer an antihistamine prior to vaccination and have you remain in the office for 20-30 minutes after the vaccination, so you are right there if your pet has a reaction. In some cases, certain vaccines may be excluded from your dog's vaccination regimen, or a different type of vaccine will be used. Many vaccines contain antibiotics as preservatives. If your dog is allergic to an antibiotic, be sure to check all vaccines for the presence of that antibiotic before use. If your dog has developed hives or a swollen face from an insect bite, you may want to discuss various options with your veterinarian. Your veterinarian may give you a prescription for an 'epi-pen.' An 'epi-pen' is a special syringe and needle filled with a single dose of epinephrine. If your pet has an anaphylactic reaction or severe angioedema, inject the epinephrine using the 'epi-pen' and seek emergency veterinary assistance immediately. Be sure to take the 'epi-pen' with you on any trips or hikes. Allergic contact dermatitis occurs in dogs as a hypersensitivity reaction to certain molecules in the pet's environment. Irritant contact dermatitis results when the skin is exposed to noxious substances in the environment. The symptoms and biologic mechanisms involved in these two diseases are similar so they are often discussed together. 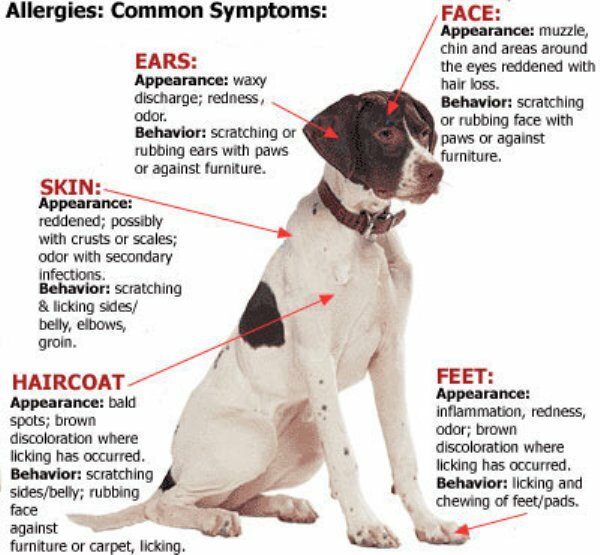 Allergic contact dermatitis is a rare disease, which occurs when an animal's skin overreacts to certain small molecules in the environment. Substances, which can cause allergic contact dermatitis include certain antibiotics applied to the skin; metals such as nickel; materials such as rubber or wool; and chemicals such as dyes and carpet deodorizers. Irritant contact dermatitis occurs when the skin is exposed to severely irritating chemicals such as the sap in poison ivy and salt on the road. How do these two diseases differ? Allergic contact dermatitis only affects those animals with a hypersensitivity to the molecule. Irritant contact dermatitis would affect every dog that is exposed to the irritant. Allergic dermatitis requires multiple exposures to the molecule before it develops. It rarely occurs in animals less than two years old. Irritant contact dermatitis often occurs in inquisitive young animals who get into things they should not. What are the symptoms of allergic and irritant contact dermatitis? Lesions generally occur on the areas of skin that are sparsely haired and directly exposed to the offending molecules. This often means the back of the paws, abdomen, muzzle, and lips. The affected areas are very red, have small bumps or vesicles (blister-like lesions), and itch. In irritant contact dermatitis ulcers may appear. How are allergic and irritant contact dermatitis diagnosed? The history and physical exam can often indicate what is going on. To isolate the allergen (molecule that caused the dermatitis), exclusion trials are often performed. In these trials, the animal is restricted to an uncarpeted room and kept off the grass, for instance. If the animal's condition improves, potential allergens are slowly introduced one by one. A 'patch' test can also be performed. In this test, a small amount of the allergen is rubbed on the skin, or a gauze pad containing the suspected allergen is bandaged on the pet's skin. The skin is monitored for 2-5 days for a reaction. How are pets with allergic or irritant contact dermatitis managed? The key to managing this condition is removing or restricting exposure to the allergen or contact irritant in the pet's environment. If that is not possible, then fatty acids, antihistamines, biotin, and topical shampoos can be used to control the itching. File a written complaint against the veterinarian, if you know who he/she is, with Veterinary Council of India at [email protected] ; 011-26184149, 011-26184354. Additionally, AWBI can be informed at [email protected] , so that the AWBI can take up the issue with the Veterinary Council. Please contact Khushboo Gupta ( [email protected] ) for any clarification or help. Please see below a note on what’s wrong with tail docking and ear cropping. Infection: Infection local or systemic will delay the wound healing. A good antiseptic dressing should be applied and changed regularly. A systemic antibiotic should be selected based on the type of infection for which antibiotic sensitivity test is helpful. *A complete blood testing is thus recommended in cases of long standing wounds or ulcerated wounds like blood haemoglobin, total protein, urea nitrogen fasting blood sugar, thyroid and antibiotic sensitivity test (ABST). Drugs: Some of the dogs are allergic to some drugs like amino glycosides group of antibiotics and a delay in wound healing is observed, a change of antibiotic may help. In addition drugs like Aspirin, phenyl-butazone have also been reported to decrease healing. *History is very important as it can help in identification and removal of involved agent. One minute Badmaash was walking on the road in Gurgaon's DLF Phase III. The next minute she was gone. Her owner Amitabh — who'd been walking a few paces behind her — kept calling for her but the golden retriever just couldn't be found. He spent a troubled night, then began to put up flyers asking people whether they had seen Badmaash. It was an urgent appeal as she was epileptic. Amitabh also got in touch with NGOs which help find homes for lost and abandoned dogs. They told him this was nothing new. Pedigreed dogs keep getting stolen from around the city, they said. What is behind this spate of dog disappearances? The obvious reason is that they're expensive and can fetch a good price. A pedigreed labrador pup, for example, will sell for as much as Rs 18,000, while a pug — the breed made famous by the Hutch ad — will sell for upto Rs 25,000. A stolen pup will sell for about half as much, a neat sum. According to Gautam Barat, treasurer of the animal NGO Friendicoes, "Dogs nowadays are mostly stolen from areas like Gurgaon and Noida because it's easier to transport them out of the city from the suburbs." He blames the thefts on the fact that the divide between the rich and the poor is getting wider, and that the people who live in the villages around which these satellite townships sprung up see the pedigreed dogs as valuable possessions which they can sell for a tidy profit if they can lay their hands on them. "If a pup is stolen, it is sold," says Barat. "If an adult dog is stolen, he or she is crossed and the litter that ensues is sold." The police response to the missing dogs is usually a curt "Should we look for missing dogs or missing persons?" This makes it difficult to put a finger on the exact number of thefts that have taken place so far. But dog lovers like Madhu Goyal — who helps find homes for lost and abandoned dogs — says she sends out four to five emails every month saying somebody has lost a dog. Other associations send out a similar number, say people in the industry. Shampa Dasgupta, who helps run happytails.com, a website that is involved in finding homes for dogs, says the gangs that steal dogs have done their homework. "A neighbourhood is first recced, and the dogs that are targeted are the ones that might be walked without a leash or one that might be walked by a domestic help who seems careless. Then the dog is snatched, usually by two men on a motorcycle." Cruelty to pet may cost Rs 1 Crore in India! How do dogs learn to beg for food or behave badly, particularly when they are not paid any attention? It's a combination of specific cues, context and previous experience, says researchers. How your pet comes to respond to the level of people's attentiveness tells us something about the way dogs think and learn about the human behaviour, says university of Florida's Monique Udell, who conducted the study with her team. their research suggests it is down to a combination of specific cues, context and previous experience, reports the journal Learning and Behaviour. Recent work has identified a remarkable range of human-like social behaviours including dogs’ ability to respond to human body language, verbal commands, and to attentional states, according to Florida statement. Udell and team carried out two experiments comparing the performance of pet dogs, shelter dogs and wolves given the opportunity to beg for food from either an attentive person or from a person unable to see the animal. They showed the first time that wolves, like domestic dogs, are capable of begging successfully for food by approaching the attentive human. This demonstrates that both species have the capacity to behave in accordance with a human's attentional status.